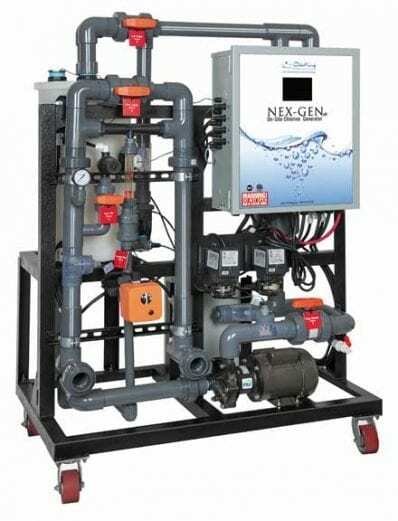 NEXGEN pH On-Site Chlorine Pool Generators - ChlorKing, Inc. The more you learn more about onsite chlorine generation, the more you will come to realize that ChlorKing’s® NEXGENpH systems are the smartest, most cost-effective technology to disinfect your pool water while minimizing water use and total dissolved solids (TDS). A 50% reduction in muriatic acid use than with stored hypochlorite. By contrast, other on-site chlorine-generation technologies require you to add fresh water and salt to generate the required level of chlorine. As a result, those systems use a lot more water – which can be critical in areas with drought conditions or high water costs – and they add a lot more TDS to pool water because they require 3 pounds of salt for every pound of chlorine they produce. It’s advisable not to use these technologies with regenerative media filters because of the rapid increase of TDS with no backwashing and water dilution. ChlorKing® NEXGENpH salt water chlorine generator systems, including our new self-cleaning models, are designed specifically for commercial swimming pools and water parks. Ranging in sizes capable of producing 10 – 120lbs per day, our patented system is the only onsite chlorine generator that uses pool water as the water source. Its design simplicity and ease of use make it the most viable alternative to traditional chlorine available on the market today. You already know that on-site production of chlorine as a solution of sodium hypochlorite alleviates all the unnecessary risks of transporting, storing and handling bulk chlorine and puts an end to ever-increasing chlorine prices. The only raw material, salt, is an inert, safe compound that is stored in a feeder on-site and used as required by the chlorine generator. It also eliminates the need for water softeners. Self-cleaning NEXGEN systems use the same proven reverse-polarity technology as our CHLOR SM salt chlorinators. The power supply reverses the polarity to remove the calcium buildup. ChlorKing® NEXGEN chlorine generator systems feature one additional advantage over traditional chlorine and all other chlorine generators: pH neutral chlorine is produced allowing for a more stable, effective chlorine to treat your swimming pool or spa.